Obi Obi Essentials | Tea and Olive Oil Grown Sustainably on the Sunshine Coast, Obi Obi Valley. 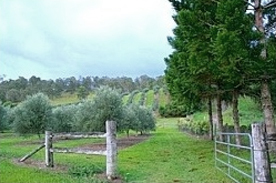 Tea and Olive Oil Grown Sustainably on the Sunshine Coast, Obi Obi Valley. A large and diverse variety of olive oil and green teas are the main products available from Obi Obi Essentials. Alpaca wool is the latest addition to our product line. All product is organically grown and produced on the family-run farm, located in the Obi Obi Valley, which is on the western side of the Blackall Range on the way to Kenilworth. Our product includes olive oil and a mixed variety of green and olive leaf teas which include additions such as lemon myrtle, ginger, turmeric and chai. Alpaca wool, which is home-spun, is also available for sale. The Johnsons’ vision is to have a productive farm that is sustainable, organic and uses best farming practices. This is a long-term adventure and one that the Johnsons want to share. or if you want to visit, please phone 07 5446 9176.